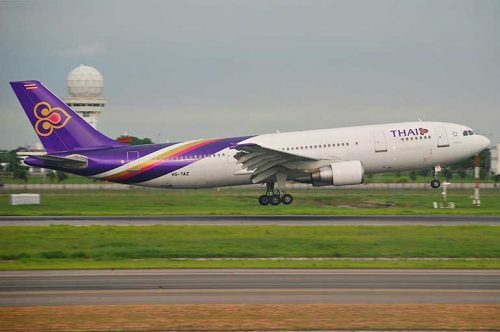 Thai Airways International has been rated among the best airlines in the world by airline review firm Skytrax. Earlier this week Skytrax held its ‘World Airline Awards’ at the Paris Air Show, with Thai Airways claiming the title of World’s Best Economy Class, along with awards for Best Airline Lounge Spa Facility and Best Economy Class Onboard Catering. Thai Airways was also rated as the 11th best airline overall. Bangkok Airways also took home two awards: World’s Best Regional Airline and Best Regional Airline in Asia. Air Asia and Air Asia X were the other regional airlines to win awards. Air Asia was awarded World’s Best Low-Cost Airline and Best Low-Cost Airline in Asia, while sister firm Air Asia X won World’s Best Low Cost Airline Premium Cabin and World’s Best Low Cost Airline Premium Sea. Globally, Qatar Airways beat Emirates to the gong of best carrier, ahead of Singapore Airlines in second and ANA All Nippon Airways in third. Emirates were in fourth, while Cathay Pacific, EVA Air, Lufthansa, Etihad, Hainan Airlines and Garuda Indonesia made up the top ten.